In Skopje Open Archive the photo documentation of the art project is present. Master Plan is an installation of drawings and a video that incorporates the recently unearthed, winning proposal by Kenzo Tange Associates for the reconstruction of the city of Skopje following the earthquake of July 1963. The video and the series of drawings present further ideas found in traces of information and the residue of research. Master Plan gives a sense of how the rational space of diagrams comes to overlap with the mystical space of illusions. 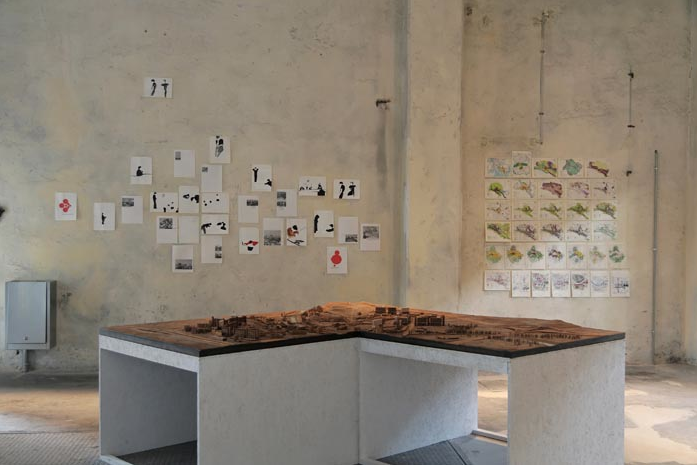 The project is accompanied by an artist book, presented as a visual reader of the urban plan model in all of its details as well as selected writing by Kenoz Tange pertaining to the proposal. The video work Obsessive setting (Rearchiving Kenzo Tange’s Master Plan for Skopje 1963/65) is based on Yane Calovski’s ongoing research and investigation of Kenzo Tange’s urban plan project for the city of Skopje and incorporates drawings, collages, photo-montages and texts. Following the devastated earthquake in July 26 1963 Skopje was a subject to a vast internationally solidarity initiative that incorporated all aspects of social, cultural, political and economic life of a city. The Master Plan of Skopje, commissioned and administrated by the United Nations has the central point in the narrative of the city’s reconstruction. In an international competition, among well-established planners, Kenzo Tange wins the first prize with 60% and opens the most progressive chapter of Skopje’s history. Over the course of the years that followed, the city became a rare case of intended brilliance (on part of the Kenzo Tanges’ team, leaders of the highly influential and important Metabolism philosophy in architecture emerging in Japan in the 60’s) and unfocused deliberation (as experienced on the ground with the local authorities running, and to a degree ruining, the process).Today the city has moved into a very different realm of political and urban discourse, committed not so much to progressive ideals of urban living as to emblematic “prize architecture” influences by politics and historicism.